How Do I Stop Outlook.com from Putting Legitimate Messages in the Junk Mail Folder? - Ask Leo! Outlook.com, like most email services, tries hard to keep spam out of your inbox by placing it in a junk mail folder. Sometimes it gets a little too aggressive. I'll look at how to tame it. My outlook.com is putting legitimate emails into its junk mail folder. I use 2011 Outlook on my Mac. I never see the emails because outlook.com is putting them in junk mail at the outlook.com site, and is not forwarding them to me. It seems very random, but some of my closest friends’ emails are going into the junk folder as well as other legitimate contacts. Can I just not use outlook.com, do I need it? How I stop the filtering of legitimate emails in to the outlook.com junk folder? Spam is an incredible problem, and email providers go to great lengths to filter it out. Microsoft is no different – their email infrastructure deals with an incredible amount of spam, I’m sure. Let’s look at the options you have to make sure you get the email you want. Unfortunately there just isn’t an option to turn off Outlook.com’s detecting spam and moving it into the junk mail folder. Maybe that’ll change someday, but for now that’s the situation. However… there is a trick1 you can play. Now, I don’t recommend it, since it means you’ll be downloading all of your spam and other junk email and relying on your desktop email program to put it in its own junk mail folder. That junk mail filter won’t have the massive amount of data that the online version uses to determine what is and is not junk, which means it’ll be less accurate in the long run. But I get that sometimes you just have to do it. 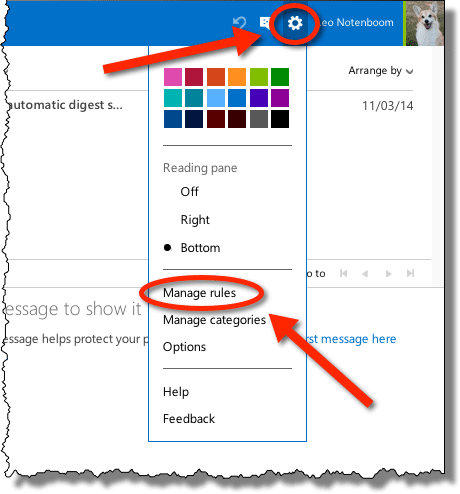 The concept is simple: set up a couple of rules that “move” all mail to the inbox. And of course click Create rule once again. Together those two rules2 boil down to “move incoming mail to the inbox” – with or without an attachment. This should bypass the Outlook.com junk mail filter and deliver everything into your inbox for you or your desktop email program to deal with some other way. The preferred solution is to leave the junk mail filter enabled, and to train it instead. That will then also help “train” Outlook.com’s spam filter to learn that, for your account, email that looks like this should not be placed in the junk mail folder. Unfortunately, your indication that it’s not junk is just one of several signals that the junk mail filter uses, and you may need to repeat this more than once as new messages arrive. While blocking senders is rarely an effective way to block spam, allowing known safe senders can be one way to bypass the junk mail filter for senders you know about beforehand. Individual email addresses can be placed on the list – for example leo@somerandomservice.com – and email coming from that email address would no longer be placed into the junk mail folder. Domains – for example askleo.com – which means that any email address @askleo.com would bypass the junk mail folder. In either case, it’s a bit of a maintenance headache, and really only helps if you know who’s sending you messages beforehand. If a particular sender keeps showing up in your junk mail folder, then it’s a way to ensure that they no longer do. Why is mail getting automatically placed in a folder I didn’t create? - If you didn't change the folder rules, then who did? I'll show you how to fix this problem. 1: Rather, a “hack”, in the good sense of the word. 2: I’ve seen other hacks that attempt to do this with a single rule, but those that I’ve seen no longer appear to work. « Previous post: Is it safe to let my browser remember passwords? A group I belong to has had a problem with group emails being directed into spam folders. According to Microsoft, the problem is likely that someone receiving the group’s email has decided they no longer want it, and rather than unsubscribing from the listserve, they’re reporting all the group’s messages as spam. It’s a losing battle, apparently. We continue to flag the messages in our spam folders as “not spam,” but never really get anywhere because this person (or people) continue to earmark everything from the group as spam. It’s unfortunate and frustrating. Some people apparently think reporting email as spam is something you do with any old email message that doesn’t interest you or that you don’t want. You touch on one of the numerous cons of “free” email — letting others decide for you what is spam. Leo has an article on this: http://askleo.com/are_free_email_services_worth_it/ You get what you pay for. I use Bell Canada as an ISP. They have decided it is cheaper to contract MS to handle their email than it is to maintain a server farm. The bottom line is it ain’t free and I am forced to deal with MSs crap. I never asked for microsoft to decide what email i get through my paid service. One solution is to use an email account not connected with you ISP. I have my own domain, and I also use GMail. It boils down to this: if you use (or are ‘forced’ to use) spam filters by your email provider/program you WILL at some time have ‘good’ email go to spam/junk folder or possibly never have it even delivered/shown to you. The only way to avoid this is to turn off the filtering options or find a work around (as Leo has shown for Outlook) and do the sorting yourself. I choose the later for both personal and work email (and I think this essential at work) and while it can be a lot of effort at times I don’t ever have the problem of missing important email. That being said there is a method I use to reduce my workload of sorting spam/junk: I make my own filter by creating a rule that deletes email based on the spammers ‘From’ address. The list of addresses in this rule is quite large and made worse because spammers are able to alter the ‘From’ address even though their spam is coming (I believe) form the same originating address. However this does reduce the amount of junk I have to sort myself. Essentially I have created my own junk filter but the beauty of it is that I totally control the filter and no email ever gets unintentionally filtered out from my inbox. I just created a single rule that appears to work, though it requires creating a new custom nonsensical Category. I can’t find an explanation of how Outlook.com determines an incoming message’s category, but I can’t see Outlook.com deciding that any incoming message has a category matching a long random string. Unless you for some reason manually assign a message to that category, then the category is probably ruined and you have to replace it with a new different one. Oops, I meant “Category is not”. The problem that I am having is that legitimate emails from a particular address are going into the “Unwanted” folder. I don’t even have a folder named “Junk”. If I right click on the email there is not option to choose “Not Junk” or “Not Unwanted”. The sender email address is in my contacts and in my safe sender list. However whenever they send an email or even if I move the emails to my inbox, they still get moved to the Unwanted folder. I have no idea how to fix this. Jeremy, have you figured out how to manage the “Unwanted” folder? I just started having the exact same problem. Mails from two (and only those two) legitimate senders keep winding up in this folder, which i had never seen or heard of before a few days ago. ive done all of those things and still..all email i sent to my self or cc myself ends up in junk..and if i say “not junk” it iwll go back to my inbox..but just for a little while, before it iwll end up right back in the junk ..any ideas? This is a fantastic article. I’m so glad that there’s a way to overcome Microsoft’s boneheaded idea to remove the ability to turn off junk filtering at a server level! I get emails that aren’t even addressed to me but they do end up in the junk file. It is the emails that I previously got in my inbox now going to my junk mail that is annoying. I must have the stupid version as, I keep transferring then to my inbox by telling it, this is not junk, yet the next week there it is back in the Junk file. I will try this but my memory being bad it will probably take me the rest of the day , flicking back and forth to see the next instruction. Good afternoon, I hope you can help me please. I have an outlook.com email account. Twitter sent me an email to activate my account. By mistake I moved it to the Junk folder instead of deleting it. Now I can’t receive any emails from Twitter and I need to do so. I put twitter.com in my safe sender list. But I’m still not receiving Twitter’s emails. Can you help please? Thank you. 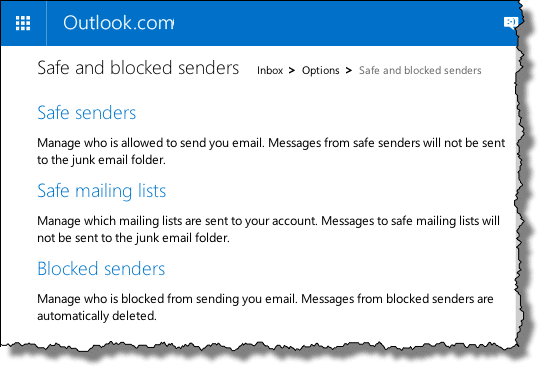 Look in your junk folder, select the email, and mark it as “Not-junk.” You can also go to Outlook.com’s whitelist function and set everything from the Twitter domain as safe. Move the email out of your junk folder (mark it as “not junk”, then open it and click on the activation link. 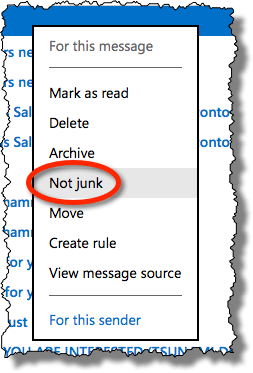 Hotmail “Not junk” option does not work. I keep marking “Not junk” same emails almost every day and they still keep landing in Junk. I believe MS must be relying on some black lists and decide for you if email is junk or not. This is very frustrating. I also find that email forwarding rules in Hotmail often do not work as expected. It is known, and has been demonstrated on other support forums, that the WHITELIST that outlook.com offers does not work. I have @scottrade.com listed as a safe sender, yet many emails, from Scottrade, yes with scottrade.com in the sending address, end up in the junk folder. So what is the purpose of a whitelist if some other list may or may not override it? I can’t believe that Microsoft can not make some type of algorithm to stop spam. By simply using the input that users move to spam box. This information could be used to filter many mails that one gets every day or marked as spam or junk. That’s exactly what they DO do. Spammers just keep changing their tactics to get around it all. I agree Roberto. I don’t get any spam in my Gmail, but I get crazy spam at my Outlook.com. That’s what brought me to this page. I’m trying to find an easy solution without creating a bunch of rules. Frequently, my ISP and e-mail provider manages to identify its own messages such as its Monthly Bill Summary, as being “Junk” or “Spam”; and they end up in that Category. For 2 1/2 years, I have done everything you mentioned in your reply … repeatedly designated email as not junk, put them in the safe senders list, told Outlook never to block the sender, told it never to block the senders domain. Nothing works! @Jim Skinner. Yeah, it seems to be completely untrainable. I did not have any problems with things in my junk mail box until this new Outlook update, now called Outlook Mail, in July where they changed the format completely. It used to be that you could just right click an item in your junk mail and click on “move to inbox and mark sender as safe” and it took care of both steps for you. Now you have to manually copy the email address and paste it into your Safe Senders list yourself. All that clicking on “mark as safe” or “not junk” does now is move that one email to your inbox, but does not add it to safe senders so the next time you get it, it will still end up in junk. “How do I stop Outlook.com from putting legitimate messages in the junk mail folder?” and I can see the steps above for managing rules for sorting new messages, Adding to Safe List, and the pictures that go with them are all from the old Outlook before the update. Everything is different now. It was working OK so they had no reason to change it. The internet search is worthless too because since they call it “Outlook” now and not “Hotmail”, the internet gets confused because when you Google a search for help, it does not know whether you mean “Outlook” for Microsoft Office, or “Outlook/Hotmail”, which are both very different, so you always end up in the wrong place. It should have been left as Hotmail so the internet could differentiate between the two. I have used Hotmail for over 20 years and now I am just too confused. We agree with the confusion on names! I understand your frustration with Microsoft’s naming procedures. It also makes it more complicated for us to answer some questions as we have to figure out which one of the three Outlooks people are having trouble with. One thing which might help is to include “outlook.com” with quotation marks or include Hotmail. You’ll still get some irrelevant links, but it should help narrow things down. Ah! Thank you for this article. I recently decided to switch over to my gmail account from outlook and setup auto forwarding on outlook.com. I noticed that anything that goes into the Outlooks Junk email folder does not get auto forwarded. Since I wanted to do the filtering at gmail instead of outlook. This trick helped me! Another way to see what’s in the spam folder. I access my Hotmail account via IMAP, and the spam folder was automatically installed in my email program and I get to check it out to determine what is and what isn’t spam. I’ve been using Hotmail since 1997. Lately online Outlook.com is more and more difficult. I now have a big problem. I get email sent to me via a Contact Us list from my website. The from address is the contact person’s address so it always changes. The Contact Us form does put the website name in the Subject line before listing the contact person’s Subjet. So I could move all email with the xxxxx.com in the subject line but Outlook.com now only allows rules for the Inbox!! I can’t do anything with a safelist because none of that info is predictable from the Contact Us email. Does anyone know how to make a rule on the web Outlook for the Junk Filter? Did you have any luck? I am also having a similar problem, i’m missing emails in my inbox because the filter is quarantining more legit messages than junk. I just want to turn off the filter, and manually deal with any junk I get in the inbox! I’m using the web based Outlook. There is no, “Manage Rules”. I’m about ready to give up! The problem has been going on for years, from what I can find. Microsoft is either unable or unwilling to correct it. In outlook.com, click the gear icon and then select Options. On the left there are junk mail options, although it doesn’t appear that you can turn off junk mail filtering. Hi, all my mails in my email are suddenly classified as junk and i can longer receive emails on my inbox. Can someone pls assist me on this? me too. Its very frustrating! Thats how I found this ask Leo chat. It worked as normal and then suddenly last week I didn’t get any emails and they were all in my Junk folder. They are still going into my Junk folder. Many of them when I put them into my inbox return to the junk folder… Please Microsoft sort it. There is something new in outlook 2016 that I guess would resolve this problem. In the HOME tab, click on “Junk” button, then from the opened menu, chose “Junk E-mail Options….”. This might resolve the problems you have with your Junk mail. Please let me know if this answer worked for you. And how about the spambox folder? Hi, I tried to add email addresses and domains to the ‘Save Sender’ , but all the boxes in the Junk Mail section are greyed out. Is there anything I can do so that I could enter data to create my blocked and safe lists? I’m using Outlook web mail from my iPad. If by “add a white sheet” you mean whitelist your contacts, Leo mentioned this in the article. The basic problem is that I’m unable to add anything to my safe senders list. All the boxes are greyed out. So I can’t create a “whitelist” of safe senders. I have another, outlook.com account which works properly so this is a problem with this account and not a browser, device or user problem. Could it be that you have too many safe-senders already? There may be a limit. There are no entries in either the safe or blocked senders lists. This is relatively new account (6 months) and we only started to try to add to safe senders recently when some airline confirmations were mis-directed into Junk. This Google album https://photos.app.goo.gl/kqKzNTpq0giNAThu2 has two screenshots. One is the account which allows me to add to safe senders and the other is the account which doesn’t. Hopefully you can see the difference in the font and see what I mean by “greyed out”. Thanks for showing an interest. I posted on the MS Support forum a couple of weeks ago and after a brief flurry of interest on there, my question appears to have been put in the “too difficult, let’s just hope the problem goes away” pile. I’m afraid I don’t have a clue either. Sorry. Even after adding an email address to my Safe Senders list – emails from it are still ending up in junk. And I lost count of how many times (previously) I have clicked ‘this is not junk’. It seems Outlook.com is incapable of learning that clicking say 50 emails from the same address means that it is actually email I want to receive. And it seems it also ignores email addresses on the Safe Senders list. It is very frustrating. 1) No control of junk mail. Stop looking for workarounds. They broke it, removed it intentionally so you cannot do it. Why would you stick around a service that is actively conspiring to make your life harder and stop you from doing what you need the way you need it? 2) White lists get ignored, safe senders lists get ignored. You cannot allow full domains because MS won’t allow it. Filtering rules only contain POSITIVE conditions (that means is 50% incomplete). The guide we are visiting here is nowadays obsolete and doesn’t apply anymore. We can’t do what is suggested because the functionality is gone. My issue was all email being forwarded from one Hotmail account to another was invariably being classified as JUNK. I suppose outlook servers are too dumb to figure out that all the email is coming from the INBOX of another outlook account and that NONE of that mail was SPAM. All they needed to do was simply put all the incoming mail inside the INBOX of the second account where it belongs, but whether it goes to Junk or Inbox is decided solely in Outlook’s sole discretion and infinite wisdom. No ifs, no buts. We have no say in the matter. In a nutshell, everything that you are trying to do regarding control of spam and junk mail that you cannot do in Outlook, you CAN do in GMail (and more) without all the hassle. You cannot modify spam settings even thought it seems you can. That is intentional! They will not fix something they broke on purpose so we are all wasting our time barking at the moon. Migrating all your mail from Outlook to Gmail is not as daunting as it may sound and you will be 500% happier in the long run. Free email should not translate into “we do whatever we want with your email”. I lost years (not exaggerating here) of emails that vanished from my account during the Hotmail/Outlook transition. Now they are messing with how we organize our mail flow. Why should we reward a company with premium membership when they behave with such contempt and disregard towards their users? I wish I’d known this before deciding on Outlook, its a bit late now as I have just emailed all my contacts to say I have changed. I should have known better than to trust Microsoft. Incidentally I never get spam or haven’t for the last 12 years, my complaint is that the spam filter arbitrarily takes out messages I want including replies to an email I have sent from my outlook account. My biggest complaint is that outlook.com decided to start blocking an email from a group that I was paying to have daily updates from and it got to the point where the daily updates wouldn’t even show up in my junk folder, no matter how many times I marked it as safe or made up safe sender rules before this happened. I ended up paying for 3 months of service that I couldn’t even access thanks to outlook. The administrator of the group said “There is nothing we can do to restore your daily digest. Your Internet Service Provider, MSN.COM has determined that our Daily Digest is SPAM and they are BLOCKING it from you. They suggested I just open up a Gmail account. If I want to give up on outlook altogether, is there an easy way to transfer all the thousands of emails I still have, and all the folders I’ve set up to a provider like Gmail without losing anything? You can download all of your Hotmail emails via IMAP and then uploading it to Gmail via IMAP.